It is difficult to escape the history of Chile. I was approached by the daughter of a political refugee, eager to share her story with the world. This post is not intended as a political stance, instead it should offer a glimpse into the past and the life of one family as they leave to settle in Britain. 1) To begin Claudia, could you tell us where you are based? I live in Santiago Centro, 4 streets from Alameda behind the metro Union Latino Americana. 2) Your family left Chile when you were a child. Why did they leave? The Canadian Embassy helped my father to leave Chile as a political refugee because he was on three blacklists. He left in January 1974 and we followed in September 1974. In the UK, we were supported by the Chile Solidarity Campaign and the Chile Campaign for Human Rights (a charity). 3) Can you tell us a little about your life before you left Chile? Both of my parents are from small villages on the outskirts of Valdivia – my father is from Corral and my mother is from Huellehue. At the time of our departure, my father was Professor of General Elementary Education at the University of Chile and my mother was a primary school teacher. I was six years old when we left, my brother was nine and my sister was seven. 4) What can you remember from that time? I have many memories. I remember the day of the coup and how nervous my mother was. I can remember soldiers coming into our house and seeing a dog gunned down. I also remember going to see the big annual Christmas tree exhibition despite the curfew and having to hide from the military who were always patrolling. 5) What happened when you first arrived in England? Everything was very strange. We were adopted by a family of Quakers. I have memories of “Sugar Puffs” cereal and being given a lovely Mickey Mouse marionette for my birthday. I remember our first day of school and being surrounded by children all asking us “What’s your name?” I remember having to play alone a lot and that my brother got beaten up every day. I had to learn to defend myself too, but I also remember the kindness of a friend from Russia. I can also remember strongly the Language Centre where we had to go to learn English along with lots of people from China. 6) How did your parents adjust to England? Our parents were in shock – they had lost everything. While my father was flown out for free, my mother had needed to sell everything – including our flat – to buy the airfares. We were scared and worried about our loved ones because there were so many arrests, deaths and disappearances. Our host family, however, were very kind and we found a way to communicate. My mother would sit and talk for hours with our hosts. We had to adjust not only to the language but to our new status as outsiders. My parents also had to deal with suddenly being unemployed. We moved around a lot initially until we finally settled in Hoylake when I was 10. Over the years we adjusted to living in Britain. My father began a PhD which was supported by a programme for Chilean refugees. My mother eventually went into nursing. She started off as just as a hospital cleaner, but she then worked up to being auxiliary nurse, followed by SEN, SRN and then Ward Manager in Fazakerly Hospital. The Chile Solidarity Campaign (CSC) and the Chile Campaign for Human Rights (CCHR) provided a lot of spaces for meeting with not only other Chileans but with British people who were sympathetic to our cause. There was a huge network of party members, trade unionists, churches and other institutions that together pressured the government (Labour 1974-1979) for support and the provision of foster families and homes for Chilean refugees. Throughout our time in England my parents never forgot their Chilean heritage. We continued to listen to Chilean music and eat Chilean food, and we had many discussions about Chile. As a teenager my friends and I were awestruck listening to the stories about people we had known . We also attended workshops with other Chilean families and learnt to make traditional crafts. The Chilean community held a lot of ‘peñas’ (get togethers) with vino navegado, empanadas and Chilean folk music. The topic of the dictatorship was always discussed and we always tried to do what we could to help Chile and Chilean expatriates, for example we donated any money raised from these parties and events to people in Chile. 7) Did you have much contact with family in Chile? No. The only way to make contact was by letter and most were censured. Every new letter was a reason to cry. 8) Why did you return to Chile? My father returned to Chile in 1983 with the first ‘opening’of Chilean frontiers to political refugees. He went back to fight against the dictatorship. I returned to Chile in 1997. The truth is that I was considered a ‘problem child’ and it was thought it would be better for me to live with my father in Chile for a year … but I stayed. 9) Were there any difficulties returning? The hardest thing to adjust to in Chile initially were issues of discrimination, namely, classism, sexism and racism. It was very difficult to cope with some of the men because of their sexist remarks, and the macho culture in general. After I had my children I began to see the absolute craziness of our education system, especially when I could compare with the standards I’d grown up with in the United Kingdom. 10) How do you view the Chile of today? What is the single most pressing issue in your opinion? I see Chile as a country divided into those who are rich and those who are poor. I think there is a great distortion on what it really means to be Chilean due to years of campaigning on a Chilean image that does not exist. There are people who live in houses that are fast deteriorating and that they cannot maintain. There are broken roads and pavements, and people who die in public hospitals due to lack of staff or provisions. There are schools with leaking roofs and broken down toilets – these are things that are very common but you won’t hear about them. So in my opinion I think there is a mentality that excludes the poor but there are too many poor people in Chile that suffer from this exclusion. 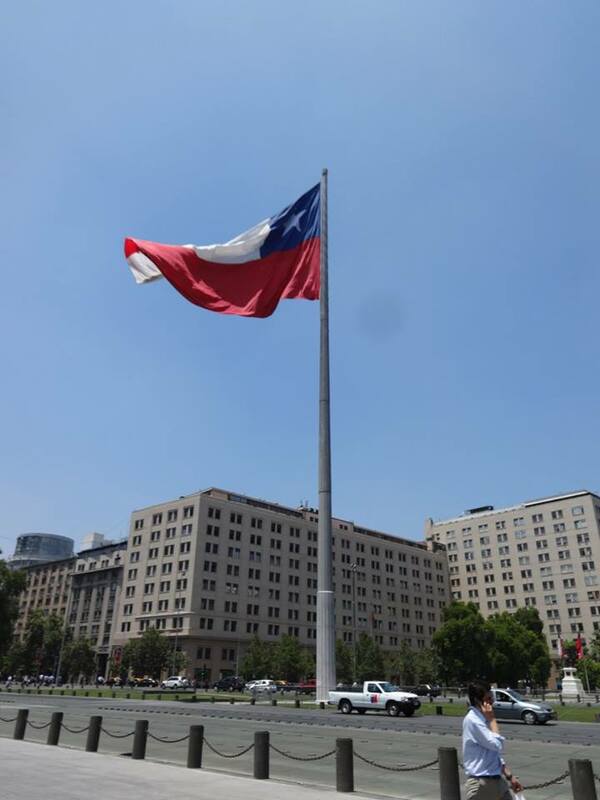 Chile is also still politically divided and many of us feel that we are fighting a losing battle as we witness public services being phased out. I now live close to Estacion Central, with the beggars, petty thieves and rubbish piled high. But there is a lot of culture to be found here and you can see this in the many murals, workshops, restaurants, cafes that are around. I also view the young people of today as having a freedom that didn´t exist during the Pinochet regime. They now have the time and space to discuss student issues. I see a lot more alternative ways of life than 20 years ago. I am happy because I know that there is a mass of very conscious young people who are now just starting to take new positions in society as adults.